THE Milton-based Marchello Racing Team has made a very solid start to this year's racing season with an impressive performance at Eastern Creek. Brothers Ryan and Reece both hit the track in the first round of the NSW Motor Race Championship, impressing fellow drivers and spectators alike with the professional presentation of the vehicles. Team manager and chief engineer Terry Marchello said race officials were "very impressed" with both the mechanical standards and overall presentation of the two black Commodores and the team as a whole. The two boys were happy with their final results. Younger brother Reece qualified in 14th position out of a field of 24, ahead of older brother Ryan in 16th. Both were able to make up ground in their first race out with Ryan turning the tables on his younger brother to finish in 10th position, with Reece close behind in 11th. They managed to maintain their positions over the course of the weekend, with their friendly rivalry on the track keeping family and friends entertained - and a little nervous. 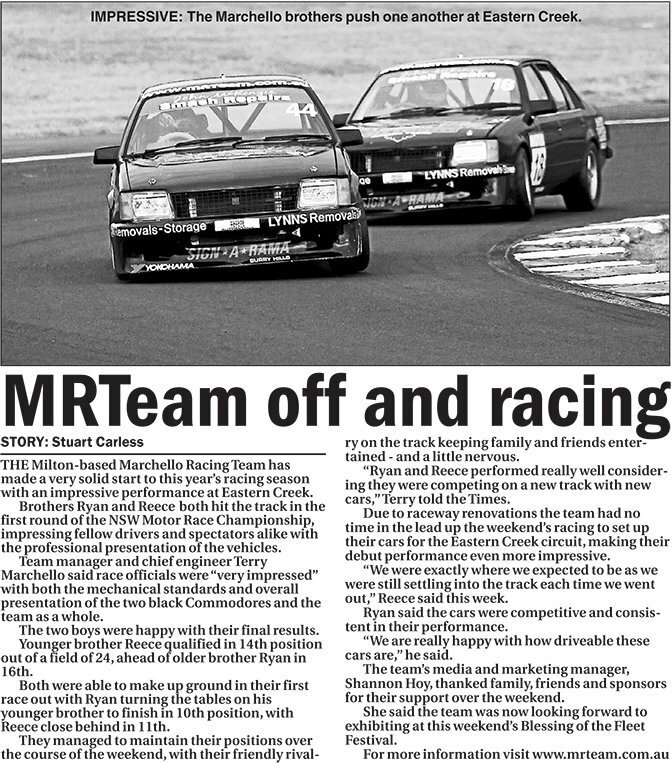 "Ryan and Reece performed really well considering they were competing on a new track with new cars," Terry told the Times. Due to raceway renovations the team had no time in the lead up the weekend's racing to set up their cars for the Eastern Creek circuit, making their debut performance even more impressive. "We were exactly where we expected to be as we were still settling into the track each time we went out," Reece said this week. Ryan said the cars were competitive and consistent in their performance. "We are really happy with how driveable these cars are," he said. The team's media and marketing manager, Shannon Hoy, thanked family, friends and sponsors for their support over the weekend. She said the team was now looking forward to exhibiting at this weekend's Blessing of the Fleet Festival.